Strapt Performance: Introducing Baja Designs! We all know that LED lighting is all the craze right now. Problem is that most of you have never seen them in person. 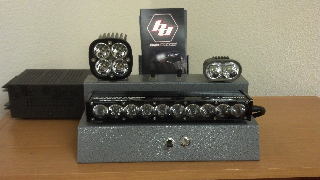 We now have our new Baja Designs display here at the shop so that you can take a look at them in person and even compare them to your current lighting setup! So come one, come all down to Strapt Performance to take a look at the Baja Designs Stealth, Squadron and Stryker and start turning night into day!